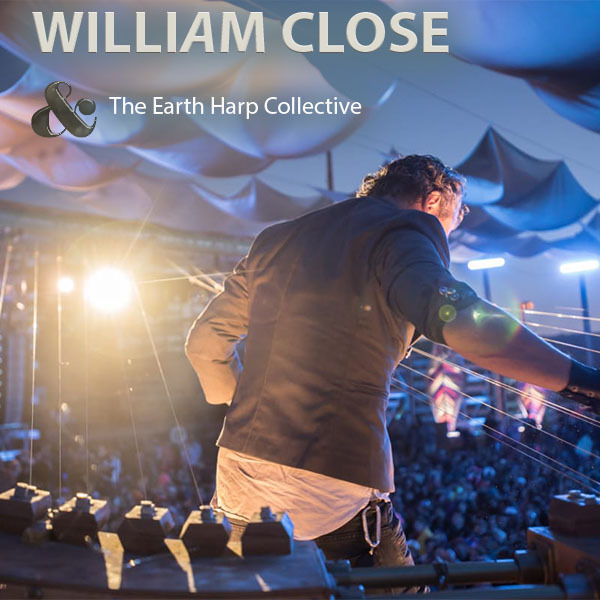 WILLIAM CLOSE & THE EARTH HARP COLLECTIVE | Love Productions Inc.
William Close is an installation artist, musician and visionary who has developed over one hundred new musical instruments including the famed Earth Harp. The body of the Earth Harp rests on the stage while the strings travel over the audience, extending up to 1000 ft. in length, and attach to the back of the venue, turning every space into an instrument. William’s celebrated Earth Harp earned him a finalist slot on NBC’s America’s Got Talent and was named by the Guinness Book of World Records as creating and holding the record for the World’s Largest Stringed Instrument. Standing at the crossroads of music and art, The Earth Harp incorporates and explores the connection between sculpting, architecture and sound design. Inspired by the Frank Lloyd Wright quote “architecture is frozen music”, William creates musical installations that use the architecture as part of the instrument. William is the Founder and Artistic Director of the Earth Harp Collective, an internationally renowned performance group that combines the creative forces of artists, musicians, dancers and aerialists.